HomeSouvenirs and relics: language, memory, and memorialisation in 1914-15. The Disappointed Turco. German’s Head as a War Souvenir. We are eagerly waiting another manifesto from the German “intellectuals” defending the comprehensive looting that has marked the German occupation of French and Belgian cities and villages. “Plunder-permits” are issued to the troops, we imagine, as rewards for good conduct, and privates, as well as officers, have filled their knapsacks with portable property in a manner that would have won the whole-hearted approval of Mr. Fagin. A similar stance is evident in an article in the Evening News on Thursday 25th March 1915. Hre, as we are told, ‘Other souvenirs are coming in, bits of a bursten shell, Prussian bayonets, iron crosses of the great 1915 crop’. The negative moral metalanguage is entirely absent, while this harvest of artefacts is depicted as part of a wider historical remembrance. War-souvenirs, as well as war- relics, are – by means of language – instituted as cultural forms (though the fact that the material value of the items is often slight is, of course, part of this differential positioning). Plunder-permits, by implication, sanction wide-ranging removal of property; war-souvenirs instead gain value as a form of private remembrance. ‘You should have seen all the stokers grubbing about after the action looking for bits of shell’, as a letter to the Evening News records in September 1914. Souveniring in a time of war can, as other reports make plain, also draw Home and active Fronts together. ‘Sacks as war-souvenirs’ were, for example, offered to the public in December 1914, here commemorating ‘Canada’s Gift’, and the sacks in which ‘the huge consignment of flour sent by the Dominions to the Mother Country was conveyed’. These were formally identified as ‘souvenirs of the war’ and, as readers were told, available at a price of five shillings with the proceeds being donated to the Belgian War Refugees Fund and the Prince’s National Relief Fund. War-relics offers other aspects of what is presented as legitimate gain. ‘He had a number of war relics’, Clark writes in his War Diary, for example, in December 1914, describing the return of one soldier from the Front, together with the material objects he had gathered up while on active service. A war-relict in the form of a ten-inch shell – ‘otherwise known as the Ypres Express’ – is likewise documented in the Scotsman in December 1915. Displayed in Edinburgh, this apparently attracted considerable attention. ‘It is a formidable weapon’, the article announced, which ‘sounds exactly like an express train rushing through the air when heard from the trenches’. Perhaps most surprising in the emerging discourse of souveniring and the forging of cultural memory is, however, that of war tours, and war tourists. The former are advertised in, for example, the spring of 1915, allowing visitors from the Home Front to engage in the varied delights of the ‘Khaki Tour’ (a weekend for 8 guineas), ‘The ‘Poincaré Tour’ (10 days for 19 guineas), or the ‘Tipperary Tour’ (variably priced) in the trenches at the Front. There was, of course, a caveat, in that tours are ‘subject to military contingencies’. Memory and the experiential nature of life at the Front are commoditized in advertising of this kind, while khaki (like Tipperary) further confirms the complex of associative meanings which such words have, by this point, firmly acquired. ← ‘Take me back to blighty’: the keywords of war in 1915. 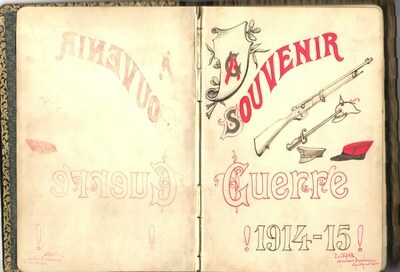 The Hennard album is interesting because souvenir is being used as the verb remember ( although it could also be translated commemorate or even ‘recall’) Souvenir de Guerre or Souvenir de la Guerre most often translates as war memoir. The English use of souvenir in French would be ‘objet de souvenir’. What is interesting to me is that one might think the English word ‘keepsake’ might have served or indeed the established Latin import ‘memento’. (As well as the coinage war-relic). Speculatively- and this is your field more than mine Lynda, I wonder if they both had key draw backs. Keepsake suggested something that soldiers brought from home rather than acquired at the front. Memento might have suggested ‘memento mori’ which was possibly a bit near the knuckle. Most tricky of all was the relationship between ‘souvenir’ and ‘loot’. Looting had been the standard practice of armies since time immemorial and probably the central motivation to combat. It had been more or less routinized before the middle of the C19th and it was simply accepted that enemy soldiers and all civilians would be robbed of their private property by the victors. Tightening international law and military discipline technically clamped down on looting in the 50 years before 1914 but practice in the field was more complicated. Taking an enemy soldiers helmet or pistol might be seen as ‘souveniring’ , an iron cross possibly, but what about a pocket watch or a ring? I think some soldiers recognised that something could be both a souvenir and loot and describing it as the former was perhaps an attempt to make it look respectable. Souvenirs as inadvertent gifts from the enemy is an interesting thought. Conscious gift giving was of course central to the truces of the winter of 1914 (most famously Christmas) and what soldiers seemed to want above all was a tangible ‘souvenir’ of the event. But I wonder about ‘captured’ souvenirs whether they were at some level magical appropriation of the enemies power to harm ( as so often Blackadder 4 has provided an insight- Baldrick decides to own the ‘bullet with his name on it’ so it can’t hurt him). War tourism is a whole other story and a fascinating one. We often forget how common this practice had been in past wars (Goethe at Valmy and an amazing number of civilians at Waterloo and American Civil War battles). In March 1915 Thomas Cook had to announce that they wouldn’t be conducting battlefield tours and requested that people not enquire.